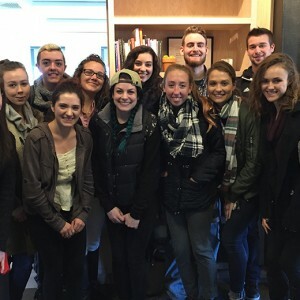 Graphic Design majors had the opportunity to explore the up-and-coming field of “information design” during an informational tour at the Fathom Information Design agency in Boston. Leaving students inspired and excited for this new field, host Rachel Harris, shared her work and the details and process of information design. Also, she shared her own experiences in the world of design after obtaining her undergraduate degree. Fathom Information Design focuses on making data digestible via the use of graphics provided students additional exposure to other professional opportunities. Fathom is renowned in the information design industry, producing work for National Geographic, Nike, Athena Healthcare, among many other well-known names. Professor Cristy Morgan arranged for a tour of the agency so that her students had a greater understanding of information design. She said it’s a topic that isn’t always covered in other small design programs. If it is covered, it is usually a project, not a course. “The ways in which they used design to showcase data was so interactive and exciting,” said Larissa West ’17. Students left inspired and excited for the wide range of opportunities as graphic designers.